Zimbabwe 298 for 9 beat Canada 123 all out by a huge margin of 175 runs. 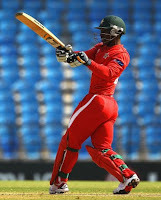 Batting first, Zimbabwe started poorly losing its openers Taylor and Coventry with 7 runs on board in the fourth over. man of the match Taibu and Ervine, carved out a brilliant 181 runs partnership in 28 overs. Contributions from Williams, Utseya, Cremer and Price, swelled Zimbabwean score to 298 at 50 overs. Balaji Rao picked up 4 wickets for a figure of 10-0-57-4, well supported by Chohan and Baidwan with a couple each. Canada lost wickets early with three down for seven in the sixth over. Wickets fell regularly and Canada were eight down for 97 and only a few slogs at the end saw them through a three figure total of 123 all out, to be beaten squarely by 175 runs. Price & Cremer picked up three each. Utseya and Lamb bowled well to pick two each. Match.13. Group.A. West indies vs Netherlands. The top five, Smith 53 of 51 , Gayle 80 of 110 , DM Bravo 30 of 38,, Sarwan 49 of 41 and Pollard a blistering 60 of 27 balls, powered West Indiea to a match winning 330 for eight. 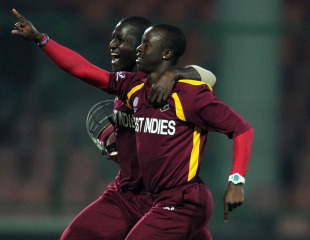 Netherlands were routed for 115 in 32 overs, to leave West Indies victorious by a massive margin of 215 runs. Seelaar with 10-1-45-3 and Bukhari 10-1-65-2 bowled well. Netherlands were swept of their feet, by the sheer pace of Roach with a figure of 8.2-0-27-6, and the guiles of Benn 8-1-28-3. Cooper made 55 of 72 and Bukhari 24 of 42. with this emphatic win, West indies are back in contention for a QF berth.